Domestic guinea pigs, also known as cavies (scientific name Cavia porcellus), are docile, friendly, social pets, enjoying interaction with each other and their owners alike. Their characteristic sounds (“chut,” “drr,” “wheek,” etc. ), pear-like shape, and ability to hear a bag of veggies being opened anywhere in the house make them endearing companions. Their life span is 5-8 years - relatively long compared to other rodents, and plenty of time for bonding with their family. The domestic guinea pig is descended from the wild cavies (Cavia aperea and Cavia cutleri) of South America. They are highly social herd animals. Wild guinea pigs live in groups that can number in the dozens. Nests are made in the tall grass, which serves to hide the herd from predators. 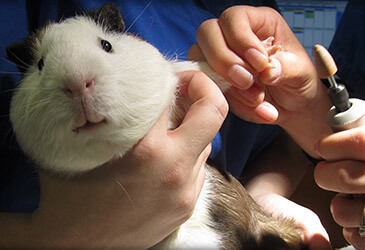 Read more about guinea pig wellness care here. The domestic guinea pig remains a social herd animal and enjoy being housed in groups of 2-3 animals. Guinea pigs require lots of space, a good deal of upkeep, and gentle handling. For these reasons they are not ideal pets for small children unless adult supervision assures their needs are being taken care of. Guinea pigs are pets for the whole family, and everyone should be involved in their care. Caging for guinea pigs should provide plenty of space, allowing different areas for play, rest, and eating. The minimum cage size for a single guinea pig is approximately 7.5 square feet, but more is better! For many pigs, the cage is where most of their time is spent. Larger cages provide more opportunities for recreation and mental stimulation. Cages may be purchased or built from scratch. Most commercial cages marketed for guinea pigs are far too small; don’t limit yourself to cages that have a picture of a guinea pig on the box. The more room your piggy has to roam and play, the happier it will be! Homemade cages are cheap and easy to build, and may be customized for your home. Materials commonly used include corrugated plastic (aka Coroplast), wood, and modular wire shelving. Wire should only be used for walls, as wire flooring can be hard on the bottoms of guinea pigs’ feet and can injure their small feet and toenails. For more details on building your own guinea pig cage, see http://www.guineapigcages.com. Every cage should have plenty of shelters - at least as many as there are pigs. Shelters can take the form of overturned cardboard boxes, PVC tubing, manufactured plastic “pigloos”, or even stylized wooden houses. Guinea pigs are easily startled, and it is very important that they have ready access to hiding spots to allow them to feel safe. Bedding can be shredded paper (avoid shiny ads - they may contain toxic substances), hardwood shavings, or composite recycled paper (e.g. CareFresh). Recycled paper is the preferred bedding for guinea pigs, as it is very absorbent, does not produce any odors, and is soft and comfortable for the animal. Cedar and pine wood shavings are not recommended, as they contain aromatic oils and resins that may be irritating to guinea pigs’ skin, eyes, and respiratory tract. Hay is not very absorbent and is therefore not suitable for bedding. Guinea pigs enjoy exploring outside the cage, and should have such opportunities daily. Placing them on non-slick flooring (e.g. carpet) gives your guinea pig a chance for extended exercise. You may choose to place them on an impermeable mat, tarp, or shower curtain to prevent floor soiling. Guinea pigs also enjoy being outside in the grass, but they need to be closely supervised. On sunny days make sure to provide shaded areas. Your pigs will likely help you mow the lawn by chowing down on the grass; this is fine as long as the grass has not been recently treated with pesticides or fertilizers. Remember that guinea pigs, as rodents, are prey to a number of animals. Always keep an eye out for cats, dogs, birds of prey, and other wild carnivores (e.g. foxes, weasels, etc). Fresh, clean water is a must for your pet guinea pig. A water bottle with a sipper tube works better than a water bowl, which can be tipped over or contaminated with waste and bedding. Hanging the water bottle on the outside of the cage so just the tip of the spout is inside discourages chewing of the sipper tube. Water needs to be changed daily, and the sipper tube should be cleaned weekly. Cleaning brushes designed for sipper bottles may be purchased at most pet supply stores. Free-choice grass hay is the most important part of your guinea pig’s diet. Hay provides essential fiber, which helps maintain intestinal and dental health, and satisfies the guinea pig’s innate desire to chew. The doctors at Pet Care Veterinary Hospital recommend you feed your guinea pig unlimited quantities of timothy, meadow, orchard, or oat hay. Alfalfa should only be fed to pregnant or lactating sows, or young, growing pups. It is technically a legume, not a grass, and has a much higher amount of protein and phosphorus than is needed by most guinea pigs. Like humans, guinea pigs are not able to produce their own vitamin C. The daily requirement of vitamin C for a guinea pig is approximately 30-50 mg. In order to prevent vitamin C deficiency and subsequent scurvy, Pet Care recommends feeding a variety of foods containing vitamin C, including fresh veggies, pelleted feed, and vitamin C tablets. Vitamin C is inactivated by light, so adding a vitamin C supplement to the water is not recommended. Vitamin C will also break-down over time, so feeding a pelleted diet with a stabilized form of vitamin C (e.g. Oxbow Animal Health brand feed) will help ensure your pig gets adequate amounts. Fresh veggies with a high vitamin C content include bell peppers, turnip & mustard greens, and parsley. For a high-quality vitamin C tablet we recommend Daily C or Natural Science Vitamin C, both made by Oxbow Animal Health. For more information on basic guinea pig care, please read the following article: Canadian Vet - NEWSMAGAZINE FOR VETERINARIANS ACROSS CANADA MARCH/APRIL 2016 VOLUME 11, NO 2. "Guinea pig standards of care"